DNA Ancestry Tests Can Seem Cheap But What is the Real Price? Why Should I Hire a Digital Marketing Agency to Handle My SEO? Over the last year or so, we've heard stories of how Apple's treatment to factory workers weren't spectacular. 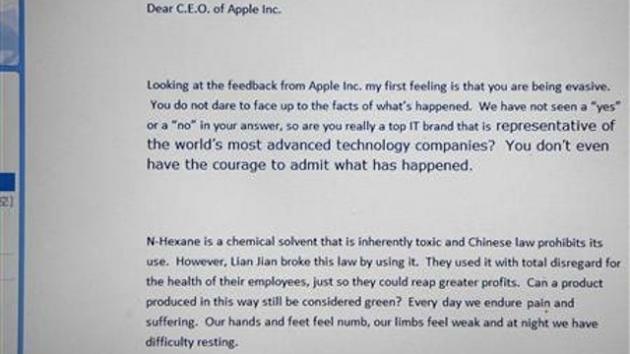 So it turns out, Chinese factory workers have sent a letter to Steve Jobs and Apple in hopes that they will notice the harsh working conditions of factories. And then, they also asked for an apology to the workers for exposing them to hexyl hydride. Hexyl hydride causes "sweaty hands and feet, sudden numbness in hands, swelling and pain in the feet, tiredness and faintness." Daily exposure, such as what the workers faced, has long-term and possibly irreversible nerve damage. "I hope Apple can respect our labor and our dignity. I hope they can stand up and apologize to us"